The birthplace of mariachi bands, wide-brimmed sombreros, traditional Mexican rodeos and the famed architect Luis Barragán, Mexico’s second city gives DF a run for its money in the cultural stakes, even if it does struggle visibly with police corruption and gang violence. Guadalajara’s cultural and culinary stars are rising, though, which in recent years has encouraged hoteliers to take the plunge. In 2015 Casa Fayette became the spot for visiting hipsters to lay their heads, and now the Marriott group’s design arm is taking its turn; providing for the business set with its first property to open in Mexico, taking route in Guadalajara’s Jalisco district. The arresting mixed-use structure was designed by Mexico City-based Javier Sordo-Madaleno Architects, and consists of four stacked geometric volumes encased in a crisscross aluminum frame that includes an energy generating curtain wall. 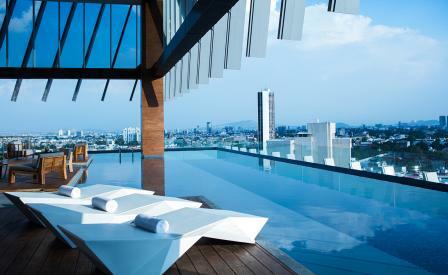 At the base is the 188-roomed hotel, crowned by a wraparound infinity pool and sky deck with views across the city. Interiors are mostly monochrome but feature some interesting design quirks; poured concrete ceilings in the guest rooms, and an original printed crystal graffiti mural that stretches from the lobby to the mezzanine level.